In this series of articles, we’d like to focus on Japanese traditional & seasonal dishes. Today’s topic will be traditional sweets called “Hanami dango” eaten during cherry blossom season. As spring approaches, Japan turns into a shade of pink. 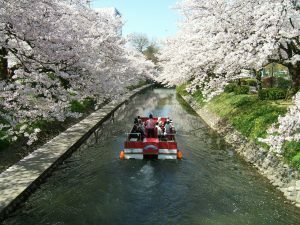 Cherry blossom viewing (or Hanami in Japanese) has been a Japan’s tradition as early as the 8th century. During Hanami viewing, the Japanese enjoy different types of wagashi (Japanese traditional confectionery) including Hanami Dango (花見団子). 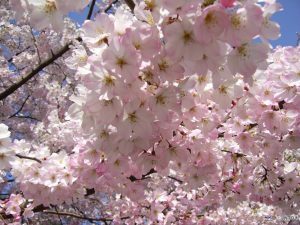 Hanami (花見) means flower viewing (of cherry blossom), and during this season, many people go out for strolls through the magnificent columns of the flowering trees. 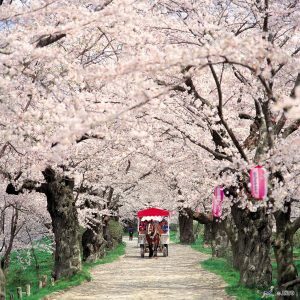 The Japanese have long been celebrated and admired the beauty of cherry blossom by enjoying picnics beneath the blooms. 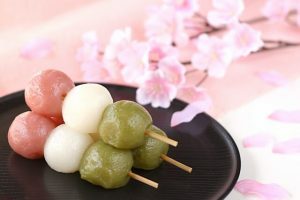 At the picnics, the Japanese enjoy some spring themed foods including Hanami Dango (花見団子) or sweet dumplings made with rice flour and skewered on a stick. 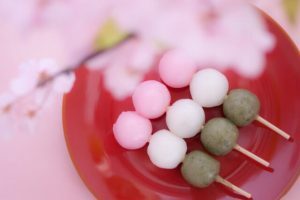 Hanami Dango is a stick with 3 dumplings in pink, white, and green (top to bottom in that order). 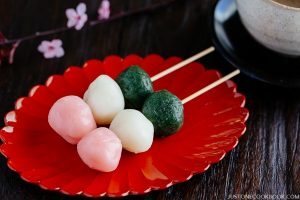 The pink and white sweet dumplings consist of sweetened rice flour, and the green one tastes a bit more earthy because sweetened rice flour is mixed with yomogi (mugwort) grass. You can purchase this sweet treat at the pop-up food stalls during cherry blossom season, or you can make them at home and bring to a picnic to enjoy them under the blooms. If you’re familiar with Japanese language, you might have heard of a saying, “Hana yori dango” (花より団子), which literally translates to “dango (dumplings) rather than flowers”. It means to prefer substance over form, as in to prefer to be given functional, useful items (such as dango) instead of merely decorative items (such as flowers).